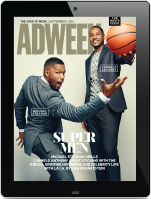 Ad Biz | Agencies | Awards | What The?? An Almap BBDO Brazil outdoor ad for Bayer aspirin has stirred some controversy after being awarded a Bronze Lion at the 2016 Cannes International Festival of Creativity in the Outdoor category. The ad in question seemingly makes joking reference to non-consensual filming of a sexual act. It depicts two boxes of aspirin with the text:”‘Don’t Worry Babe, I’m Not Filming This’.Mov” — the assumption being that it alludes to a video file. Yikes. That such an ad would be approved in this first place is bad enough. That a jury at Cannes decided it deserved an award is truly an embarrassment. 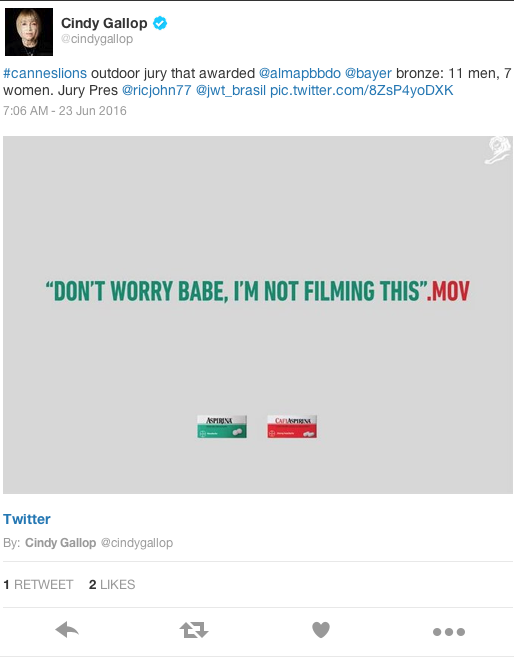 Attention is being brought to the ad, and the jury which awarded it, thanks to Cindy Gallop tweeting about it, as you can see below. Predictably, those who saw Gallop’s tweets reacted with disgust at the ad, as well as a mix of exasperation and disbelief that a Cannes jury decided it merited awards recognition. Of course this isn’t the first embarrassing incident involving sexism at the festival this year. Just yesterday, VaynerMedia and Thrillist received a fair share of criticism for a party invite intended for “attractive females and models only” which the agency attributed to third party events company iGetIn.